Absolutely gorgeous 4 bedroom, 2.5 bath updated Colonial is located in the desirable Gentry community in Plainsboro Twp. With an impressive two-story entrance foyer, this home features over 2, 800 sq ft of living space and a full finished basement. The full eat-in kitchen with center island has been updated with new granite counter tops, tiled back splash and stainless steel appliances. Ample cabinet and counter space plus a bright and sunny dining area with glass slider overlooking the large back yard. The spacious formal Living Room has a big bright bay window. The elegant Dining Room features decorative crown molding with accent lighting. The kitchen is open to a large family room, which has a wood burning fireplace with tile surround and decorative wood mantle, cathedral ceilings with skylights and ceiling fan. Separate main floor laundry room and powder room, both with tiled flooring completes the main level. The second floor offers 4 generously sized bedrooms, all with ceiling fans and 2 full baths. The large master bedroom has walk-in closet and private master bath with custom tile, double sink vanity with granite counter top, stall shower and soaking tub. 3 additional spacious bedrooms and updated hall/guest bath with tiled shower/tub surround and double sink vanity with granite counter top. Finished basement offers plenty of additional living space. Hardwood flooring throughout the kitchen, dining room, entrance foyer and entire upper level. Some additional features of this beautiful home include; solid wood 6 panel doors throughout, front porch, large rear deck, pavered walkways, 2 car garage, newer HVAC and tankless hot water heater. 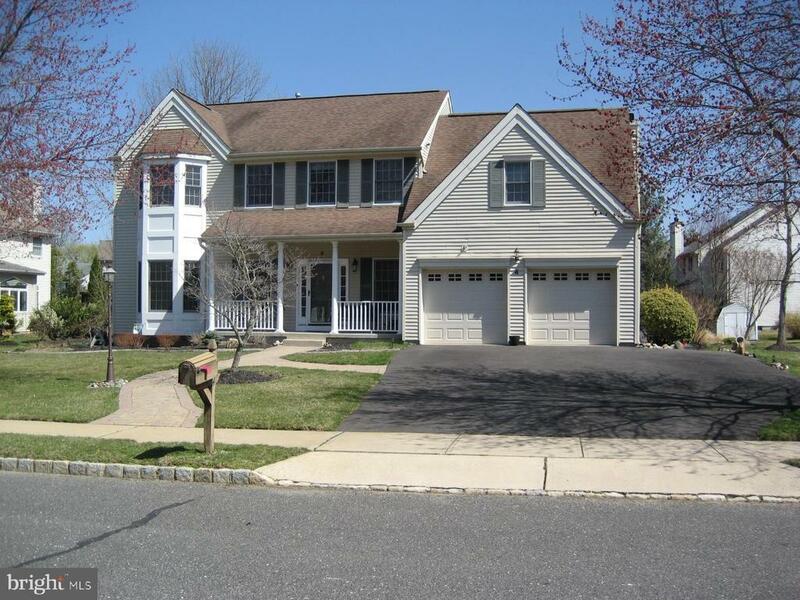 Conveniently located in the much sought after Plainsboro Township with award winning schools. Absolutely move-in ready! Come see it today!